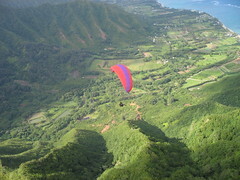 The wintertime on Oahu brings us a cornucopia of flying conditions. We are treated to every wind direction and wind speed on the scale, at some point in the winter. Because of the wide variety of conditions, the weather is often in transition between one condition and the next - the trick is to catch the best window for a fun and safe flight at the most interesting spot, something we manage to do with varying degrees of success. When we do catch a good one, it's nice to write up a few words to entertain our absent comrades. Not to rub it in, of course, but just for the fun of sharing the story. And we don't just want to hear the epic success stories - sometimes the stories of suffering and humiliation can be even more interesting. For my part, I would like to share my fleeting impression of the flying stories from three very different consecutive days of flying. I missed the fourth day's flying, at some pretty interesting spots, so that story will have to be written by someone who was there - I look forward to reading it! The conditions looked promising - light and northerly as an approaching front pushed a ridge over our heads. I only had an hour before I had to pick up Logan, so I scrambled out there and followed Jorge off of Manix to fly for an hour in a perfect window of light northerly flow. Jorge made the run out and back to Puu O Kona, and I flew out to the far side of Rabbit Island. The wind strength only started to pick up as I landed, and I heard it got so strong later on that there was widespread carnage on the LZ. That might be a story worth telling - anyone who was there feel like sharing? This day brought us a brief glimpse of our familiar tradewinds, moderate and easterly, so a bunch of us headed out to fly at Kahana. It started out perfect, but another approaching front gradually cut off the wind as the day progressed, so the last handful of stalwart pilots to hike up were rewarded with sled rides for their trouble. The Canadians got their best day of flying yet. I know there are some stories from that bunch - ask Norm about his experience with one of our lesser known venturi areas out there. Russell has been telling me he's ready to go XC, after years of protesting his unreadiness, so I was excited to have a likely looking day to lead him away from the hill. He gamely followed me, but the conditions were so light that we could barely stay up on the next ridge, so we finally gave up and flew halfway back to land near the beer store. Thanks to Jayson for the retrieve! Russell proved he is definitely ready for some cross country adventures - he kept a cool head as he traversed some new territory and scratched for a long time in difficult conditions before picking out his LZ. That might be a story worth telling! On Saturday we got light pre-frontal southerly conditions - a huge gaggle of pilots went out to fly Nanakuli. What an amazing scene! When I showed up, Frank was in the air working to stay up at ridge height, and he reported that Flapper had already flown over the back towards Mililani. Wow! I wouldn't mind the chance to do that myself! Let's go! Sandy, Jorge, McStalker, One-Eye, Ray, Scrappy, Sky Bunny (thanks for sharing the pix, Jiah!) and I all ran up the hill as Ken was launching low, and we watched him fight a losing battle with gravity. Jorge still thought it would work at low launch, and hucked off with great enthusiasm, only to follow Ken down to the dirt. In my excitement I was already half laid out - so even though I know it would be smarter to hike higher, I launched anyway, and I struggled to stay in the game just long enough to hook one small but strong column of rising air to ridge height. From there I watched Frank land, and then I watched Ray launch and also struggle in vain, along with Jorge who had rushed back up for another dose of punishment. After a few trips up and down over the ridge, I finally got tired of waiting for my posse to come and help me combat the bullets over the ridge, so I headed across the valley to see if the thermals on the other side were any more pleasant. There wasn't even a hint of rising air all the way across and I returned low and resigned myself to a landing in the schoolyard. My phone rang as I was gliding down, and I tried to answer it but accidentally fumbled the speakerphone on by accident - I heard a loud deep voice intoning my name: "Alex?" I had no idea who it was, but after hesitating a moment, I answered "Yeah? ", and then the voice boomed out "How's the air?" On the off chance it was the voice of a heavenly presence calling to mock my final glide, I considered making a humble plea for nicer air. But first I had to know: "Who IS this?" to which he answered with surprise, "It's Doug! ", and I'm thinking, well Doug's sort of like God out here I guess, so maybe that's why he sounded like that. As I landed in the baseball field, the cycles were blowing through there strong enough to kite. Scrappy hucked off of middles. He worked it valiantly but still found himself inexorably sucked to the surface on the dump side, where Ray and I picked him up soon after. Meanwhile Fireman reported on the radio that he had picked up Jeff at Lualualei Homestead and they were now hiking up the Waianae ridge to check out a new launch. Wow! Could Jeff have flown over the back to Mililani and then BACK to Lualualei? Now that's a story I would love to hear! But apparently Dave struggled to stay up and eventually raised the white flag. Ray and I had to leave just as Scrappy started his hike back up at Nanakuli for a shot at redemption, along with the Canadian crew who had just arrived for the late shift, and Doug, and I think Christine and Bill were there too. There must have been like 10 more flights after Ray and I left, including a few that made it to cloudbase - I wonder if any might be worth describing in a few choice words? 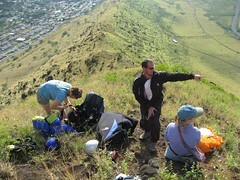 On Sunday I heard that a bunch of folks enjoyed some fun flights at Mariner's Ridge and Koko Head. I heard Jeff flew to Sandys and Frank flew to Hawaii Loa and back, and then Reaper followed Jeff up to Koko head where they threw off some tender fledglings to soar the cliffs over Portlock before landing and fleeing the scene of the crime in the nick of time. Now don't tell me there aren't some good stories to be told from that day. Don't be shy - somebody spin a yarn for us! I have a few choice words to say about my flight, but I don't think they'll pass our blog's sensitive "family-oriented" censors! Alex -- you didn't give full justice to the hour you had soaring around above the peak. You certainly deserved it! You made a sweet move soon after launch, using the bit you gained in the launch cycle to get yourself over the spine on the low part of the ridge. From there you were able to use the best lift the little ridge had to offer to get you to the good stuff. Excellent! I was all set to give it a go myself, but then was left uncertain which way to go when Jorge and Ray couldn't pull magic out of the air. Sure, the streamer was going sideways most of the time, but the air felt so fresh, it had to be working. Note to self: air blowing sideways along a ridge is NOT going UP! Nonetheless, Jorge was a great inspiration, and I still nearly followed him in taking a chance on a fighting sledder. But then I thought perhaps I should save my strength for following Neo higher up the hill. And so I waited. And waited. I think I spent over four hours on that hill, watching the streamers, feelng the air. Finally, with Doug on his way up, it was time to cash in all that rest and get moving to higher ground. No matter what, it would be a learning opportunity. As Jiah's video shows, Doug made it look easy -- all up! Not so easy for me -- I had plenty of opportunities rocketing up around me, but I failed to keep my glider in them. Still, I'm glad to have waited around and made the extra hike. It was fun to at least try. Nanakuli and I will spar again another day. Sandy, those are sweet pictures. Don't forget to add them to the Wind Lines pool in Flickr when you get a chance. Thanks for trying to give me credit for my hour above the ridge - frankly it felt like two hours! All my thermal flights tend to put me into the 9th dimension where time slows down to about half speed. I just never felt that comfortable or confident up there - I found the thermals to be strong, but infrequent and sharp edged. Maybe next time when there's a whole gaggle of us up there I'll be able to keep my spirits up! Saturday Nanakuli: Hiked once, watched Ken, Jorge, Ray, sink out from lower launch. Alex makes it up with a nice luck, skill combo. I tend to pull off one or the other but not both so I hike up to just below upper launch. I didn't know where upper launch was so I made up my own. Wasn't doing great so I went to the dump side. MISTAKE! Hung in there for about 10-15 min. really low getting some weird lift from the dump b4 Alex and Ray pick me up. I'm pissed so I hike again to actual upper launch. Doug is up and gone. Sandy gives it a go but can't hold it Paul goes for it and hooks one over middle launch right as I get in the air. I go to his lift and follow the thermal drift to the top of the mountain. Paul falls out and heads down. I'm not in good shape physically and left my jacket in the field where I landed earlier so I fly for 45min and spiral down to land too hot and too cold with a nasty headache. Saturday (no more hiking... yea right) Arrive @ Sandys to give Pete cash for vario. We check Mariners Jeff is LONG GONE, Frank is cruising with some big OD in the sky behind him. Randy, Reaper, Airborne, Bill, Christine and I parawait sudden high winds b4 hiking back down and heading to Koko. Hike Koko behind Jeff and wife with the Mariners crew. Huck off of Kokohead for a 45min flight. Nice cliff soaring, but have to book it for the LZ b4 a big squall hits us. Pack it up and beers @ Kona brew pub. A bunch of us fly in the light evening air at Makapuu. As I arrive Jeff (jetflap) is launching at the lighthouse and flies his now standard " three bases" run ending up at Sandy's. Frank and I launch Cactus and just before the sun goes down I hook a glass off thermal from over the beach bathrooms up to 2200' as I drift over the back. I contemplate heading back to the LZ, but decide to use my altitude to glide over to Koko. The air is so smooth and nice I glide over and past Koko, past Costco, past the boatramp and slide into Kuliouou Beach Park in absolutely still sunset conditions and proceed to hold court with a bunch of 6-8 year old soccer girls. Frank drives out for the pickup. Lots of altitude, but strong north winds keep me from going too far. I retreat before I can get up at Olomana. The day finishes really strong with some interesting displays of ground handling, including myself. Jetflap Jeff gives me a call on my way out to Nanakuli that he has landed in Waianae after getting up to 3600' at Haleakala. I pick him up and talk him into hiking up the ridge that separates Waianae from Makaha. We hike up in wind that is definitely soarable, but we climb up a ways to give us a better bombout and layout. By the time I clear the chosen launch spot the wind starts pausing more and more. I launch into a suddenly rare good cycle and climb up in active air but can't find any organized thermals to turn in. I bounce around at about a grand, while hearing the guys at Nanakuli bombing out (except Alex). I find a thermal to 1600' but it disappears for me. I start heading back on the long spine towards the big hill in the back, I search for lift but nothing comes. In hindsight I should have rushed straight to the back and searched there. Instead I meander to the back low and hunt and search in ever fading lift at about a grand. Eventually I throw in the towel and land in a huge pasture in Waianae Valley. Frank picks me up AGAIN!